‘Roaring Skies’ Getting Another Print Run! We have received word that TPCi has decided to do another print run of Roaring Skies! This new print run comes almost 20 months after the set’s initial release in May 2015. TPCi will ship the product to distributors between the end of January and the beginning of February, meaning you’ll see Roaring Skies booster packs on store shelves in the next few weeks. As far as I know, this is the first time a set has had a major print run this far after its initial release. According to distributors who spoke with TPCi, this extra print run be a special one-time thing. Apparently, TPCi underestimated the demand for the set and didn’t print enough of it. Guess this means no Shaymin-EX Box in our future. My sources also say that we're getting Lv.X cards in SM2 as well! For some reason, I read this as "'Roaring Skies' is getting reprinted!". I'm glad I read it wrong! I wonder why TCPi underestimated the initial demand. Did they print less than normal? Or was the expansion just really that popular, all because of Shaymin-EX? Oh, so this was real after all. Glad to see a second source confirmed it. I feel like the price on good cards from the set may drop with this reprint, though it's hard to judge for now. I would definitely love to pull another FA Shaymin EX though. Finally, new players can semi-easily get Shaymin EX! I don’t know why they don’t just release a Shaymin-EX Box, but I ain’t a businessman either. Thats good because im broke and have no shaymin exs and love mega ray decks i literally two days ago pulled a fa thunderous ex and gallade is cool but really i feel like it was a bad financial move on pokemons part because pretty much all they are reprinting it for is mega ray and shaymin. Vexen_IV The Paul Heyman to Giratina-EX's Brock Lesnar. I don't know how I feel about the whole 'underestimating the demand' of RoS. This set added quite a few viable cards, including probably the most sought after card of B&W and beyond EXs. OK i'm ready for more Thundurus and Gallade EXes but in exchange the rest of you better pull those Shaymin. It is really odd to have an older set get another print run so late in it's life cycle. Must be why they're saying it's a 'one time thing'. It is a risk with the set's age and the only money cards are Rayquaza EXes and Shaymin EX.. More Trainer's Mails, Sky Fields, and Double Dragon Energies are nice but those could have a nice easy printings in more Expanded Decks. Guess more Mega Turbos are also nice as those would be hard pressed to put into preconstructed products. I'd rather have a Shaymin EX box but the comapany seem to think it's worth reprinting the set. What happened was they knew people wanted bird EX Pokemon and since the set didn't have any in them, they printed less of it. In other news, I'm now selling full art Shaymin EX! With Expanded being a thing, it makes sense for them to keep the set around. Darkrai EX from Dark Exploarers is still about 50 bucks despite being printed again as a promo and in a starter deck do I dont think full art Shaymin EX will drop below 70. Well, they might be worried about extending its time in Standard play if they released a full on reprint. Even releasing it as a surprise extra XY Black Star Promo, that would still ensure the next rotation has to jump to SM-On to be rid of it... and that would mean an unprecedented 10 expansion cut! This is bad. a shaymins ex box is bad. A reprint of shaymins ex is bad. Be rest assured that all these packs will fly off the shelves in less than a week. Shaymins ex values will go down. "Apparently TPCI underestimated the demand..." HA. TPCI underestimated the amounts of players opening countless packs hoping for shaymins. This isn't a set re-shelf, it's a Shaymin re-shelf. You say "chance". Does that mean you were buying boxes in hopes of a Shaymin EX? You should just go for the single. So this is just a plain "2015" Roaring Skies print, and RS will still rotate out of standard on schedule, right? Yes. Cards printed with their old set symbols retain the legality of the original release. If the cards in this set were reprinted with a new set symbol, they'd be consider new releases. Would be interesting if these are printed with new symbol and copyright year. You're pretty person for not understanding what sarcasm is. I was obviously showing my doubts about this. Really need to learn to not take everything so seriously. They've printed EX Boxes with exact reprints last year of already rotated XY Sets. They easily could have took the Roaring Skies Print and put it in an EX box and they would have sold like crazy. Perhaps they're trying to not nuke Shaymin's Secondary Market value but they already should have know what effect the return of Set Up would have been on the game even if they reduced it by one card draw. Trust me I was ecstatic when they didn't print the 'Best of' XY set last year I don't want Shaymin or any EXes standard legal for longer then needed but they showed another way to print it outside of a Battle Arena Deck last year with the EX Boxes last year. They're willing to have 'exact' reprints of cards in other later products. I was quite skeptical due to the fact that we haven't seen such a thing ever before for a regular set (unless I'm wrong or skipping over a set). I was wrong, and this is more than a prank. 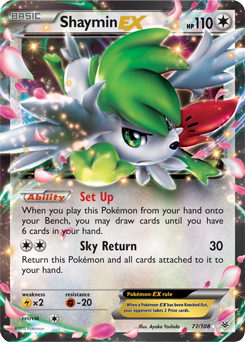 I'm hoping shaymin goes down in price( along with other roaring skies cards). It'll be cheaper to complete now. I am not one to rant. However, I would like to semi-rant about why Shaymin EX is not a format destroyer. First off, Shaymin EX marked a point in Pokemon where you started to leave casual play and entered into competitive territory. 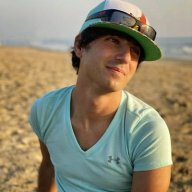 Decks can play and perform well without Shaymin, except for a select few. If you're a casual player you can simply choose not to play those (Example: Mega Ray, Despair Ray, etc.) decks. For someone like me who wants to get good and be able to perform well at tournaments, I knew that the first step was to invest in some Shaymin. Just a disclaimer: I may be 14 however I provided the money for the Shaymin so they weren't just handed to me. Getting them was a trial but I knew that it would be a step in the right direction. Secondly, Shaymin EX didn't make the format bad or unbalanced. I don't have much to say about this, however if you want to see an unbalanced format, go to your local Friday Night Magic scene and watch the standard. You will see the same 3 decks played all across the table, I guarantee that. Lastly, a rerun of this set is not as bad as you think. Yeah TPCi may be printing money by printing more Shaymin. However, this will make them a bit easier to find. With more Shaymin being injected into the trading scene, the price will go down at least a little bit. When all is said and done, at least Pokemon isn't slapping the Legendary Bird trio onto blister packs just to sell into the Pokemon Go craze. Soooo yeah. That's just my own opinion, obviously, but honestly I don't think this is too big a deal besides more Shaymins being on the market. They've printed EX Boxes with exact reprints last year of already rotated XY Sets. I have never purchased these products and was unaware that they contained a new printing but with the same set information (like a Battle Arena Deck). Yes, that would have been an option then. Can you tell me which EX Boxes did this? You are correct; Shaymin-EX made an already unbalanced format more unbalanced. I get it, there are TCGs with worse formats out there, but please at least entertain the notion that in a TCG like Pokémon already suffering from pacing issues, creating another way to speed things up was not what the TCG needed.